The story is my column called "My mother says Tao Li is too fat to win". The column was published in The New Paper. As usual, I posted the column on this blog. The article was mentioned on two online forums at Hardware Zone and Spatchy. The comments were generally positive. But I felt the need to correct the perception that I was mocking foreign talent in the column and so I wrote a blog post entitled "Not my intention to mock foreign talent". 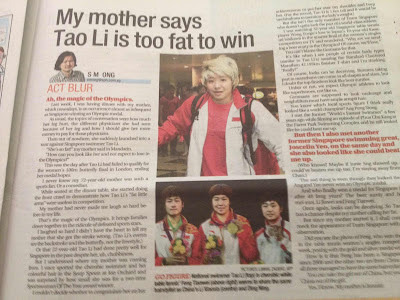 AsiaOne website picked up my column (which it has done before) and put it under the heading Sports. Then AsiaOne did something it has never done before with my column - it shared the link to the article on its Facebook page and exposed my column to a whole new readership. That was when things got a little crazy. People on Facebook, Twitter and blogs started condemning my column (and my post "defending" it) for being rude, offensive, trashy, unfunny, xenophobic, sexist and so on. My favourite comment is "My father says the reporter is too stupid to be published". A blogger named Andrew Loh even wrote a post dedicated to calling me stupid entitled "Wow. This guy is really stupid". Reddit and The Singapore Daily linked to my blog, bringing in another wave of new readers. That was when the tide seemed to turn a bit and I started to get more positive comments again. Even my old boss, former CEO of MediaCorp and SPH Mediaworks Lee Cheok Yew, wrote a supportive comment on my blog. I haven't spoken to him in a decade. A blogger named Dotseng wrote a blog post entitled "Wow... this Andrew Loh is really stupid to call that TNP journalist stupid!" In the blog, Dotseng referred to me as the nameless "poor TNP journalist". So you see, it was a rather interesting National Day week for me.